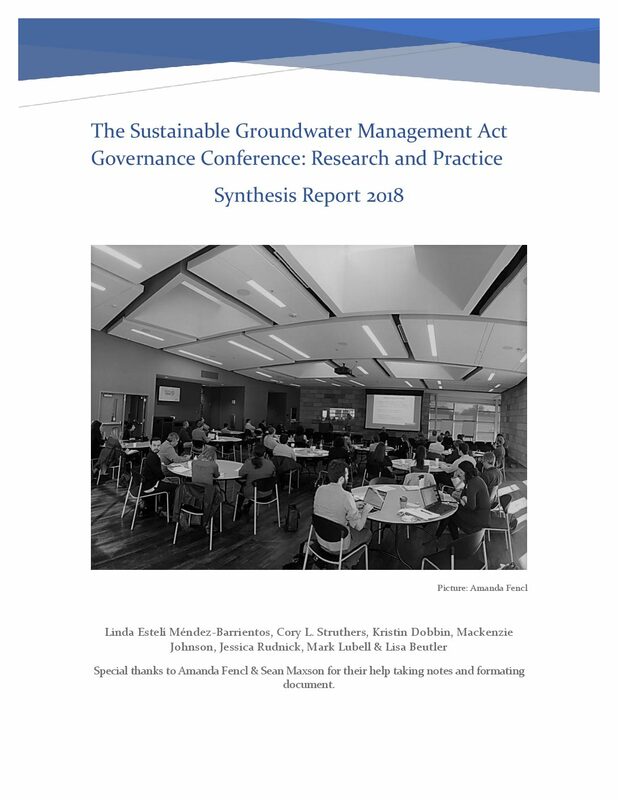 “The Sustainable Groundwater Management Act Governance Conference: Research and Practice,” held at the UC Davis in February 2018, assembled 55 social science researchers as well as practitioners from across the state to discuss the ongoing implementation of the Sustainable Groundwater Management Act (SGMA). The California Legislature passed SGMA in 2014. SGMA required the formation of new groundwater sustainability agencies (GSAs) by June 2017 in order to develop and implement Groundwater Sustainability Plans (GSPs) for 127 medium- and high-priority groundwater basins by 2020 and 2022. With such a large task at hand, and given the importance of groundwater to California’s public health, environment, and economy, strengthening collaboration across research teams as well as between researchers and practitioners is crucial to increasing the capacity for learning about governance processes and to bridging the science-policy divide in order to support the creation of effective governance institutions. The goals of this report are to synthesize key lessons learned about SGMA at the nexus of research and practice, and to create a roadmap and research agenda going forward. Sharing information and knowledge among research teams enables a comparative perspective that cannot be achieved by one team alone. Furthermore, perspectives from practitioners inform research directions, focus attention on relevant issues and knowledge gaps, and build relationships among the SGMA community for more collaborative applied research. Conference discussions focused on discovering what has been learned in the first three years of SGMA implementation and GSA development, identifying high priority questions for the next stage of GSP development, sharing research methods, and coordinating research activities.